Julie brought us her manuscript as a Word file with her own colouring and formatting already included, we then took that file and converted it in to standard reflowing ePub and Mobi files—preserving her original formatting and bullet points. She provided her own cover which we placed on the front. We uploaded the ePub and Mobi files to all 5 vendors. 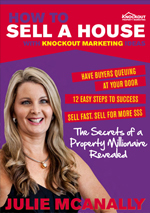 Property millionaire Julie McAnally reveals her secret and successful real estate marketing ideas and strategies in this quick and easy-to-read E-book. You only have to spend one hour of your time to read this book and we guarantee it will completely open your mind to amazing new marketing ideas for selling real estate. This book will show you how to knock out your competition and create a huge swell of market energy around your property. Regardless of the market conditions in which you are selling, these Knockout Marketing Strategies will get your property noticed and sold quickly for the best sale result. This book will reveal how to offer buyer incentives to draw potential buyers to your property. How would you like to offer the purchaser of your property the “CHANCE TO WIN $100,000”? You’ll learn how this works and also how to offer other incentives for people to come and inspect your property. Julie has simplified the process of a successful sale into 12 easy-to-follow steps. They range from tips on how to present your home and selecting the best real estate agent right through to creating your all-important marketing strategy. This book will challenge the way you think about marketing real estate. It will dare you to think about marketing your property as a “product” and open your mind to new and exciting ways to market that product.